Pharaoh ants driving you crazy? They crawl out of wall switch plates, along sinks, bathtubs and seemingly appear out of nowhere. Spraying won’t kill them in most cases either. But using an old tried and true technique with an “Insect Growth Regulator” just might do the trick. Pharaoh ants (Monomorium pharaonis) don’t really get their name from the ancient pharaohs of Egypt, but rather from their scientific sub species name “pharaonis”. There are some stories floating around about these ants infiltrating the tombs of the ancient kings. But in modern times Pharaoh ants have been and continue to be a serious problem in hospitals, medical facilities and homes. They are considered a “tramp ant” and 1 of approximately 6 ants having this designation. The other tramp ants are Argentine ant, Crazy ant, Odorous House ant, Big Headed ant, White Footed ant, Rover ant. Fire ants are often considered to be a “tramp ant” in some scientific circles, although they do not commonly infest homes and buildings. Pharaoh ants are – considered a “tramp ant” because of their small size, multiple colonies and varied food sources. They are some of the tiniest of ants, 1/16th – 1/32th of an inch and are often confused with thief ants and rover ants. Pharaoh ants are golden tan to golden brown in color. All workers are the same size. The queens are substantially larger than workers. Pharaoh ants are not native to the United States. They were imported from abroad centuries ago in ships and cargo. They can be found across the entire United States and scattered around the world. Most major cities of the world have Pharaoh ant infestations. These prolific little creatures can hitchhike on boxes, packages, food and plant containers and wind up just about anywhere. Once introduced into a new environment, they can easily find a suitable means for survival in homes and buildings. That’s why they are considered a “tramp ant”. In the 1980’s, Pharaoh ants became well known in hospital circles where they would routinely infest burn units. These ants would appear out of nowhere and openly feed on the exposed skin and mucous of burn patients. Pharaoh ants would also appear in nurseries and infant care centers and feed around the mouths and eyelids of babies. As you can imagine, this created an uproar across the country with news articles appearing on local as well as National news networks. In recent years however, Pharaoh ants don’t make the news quite as often as they once did. They can still remain a serious threat in some cities, especially those areas where outdoor pesticide usage has drastically declined. Pesticide reduced usage programs in and around medical facilities leaves the door wide open for these ants to infiltrate. Most homeowners only spray pesticides when they see a problem. This also creates opportunities for Pharaoh ants to infest. Whatever the situation is – hospital, nursery, daycare center or home, Pharaoh ants can become a real problem where professional expertise is needed to get rid of them. 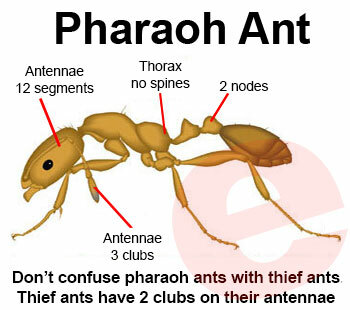 Using the correct products will make getting rid of Pharaoh ants much easier. Pharaoh ant colonies are often hidden inside wall voids, and can be found in the insulation of outer walls and around water lines. They need moisture to survive and also are attracted to heat. Their colonies are often small in comparison to other ant species, with only 2500 or so workers present. Pharaoh ants are also “polymorphic” meaning multiple queens. 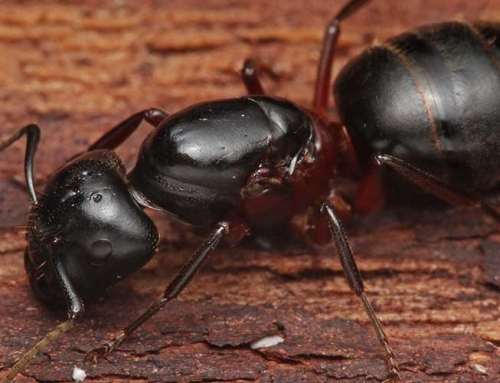 While some ant species have a single queen, these ants have many queens per colony. As many as 100 queens or more per colony have been known to exist. That’s a lot of queens for a small size ant nest. Pharaoh ant colonies will also “bud” or divide into several new colonies. So the few ants that you see crawling on the wall or across the counter may be an indication of a much larger problem. If the correct treatment methods are not used, Pharaoh ant populations can grow and explode in response to incorrect treatments. 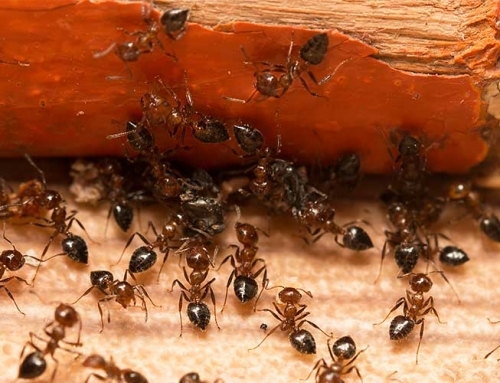 In some situations, controlling Pharaoh ants can seem like an endless task with them showing up in random areas and you seemingly “chasing” them around the house. Professional Grade – Not Available in Hardware Stores! Search Entire Catalog – Over 1,000 In- Stock Products! 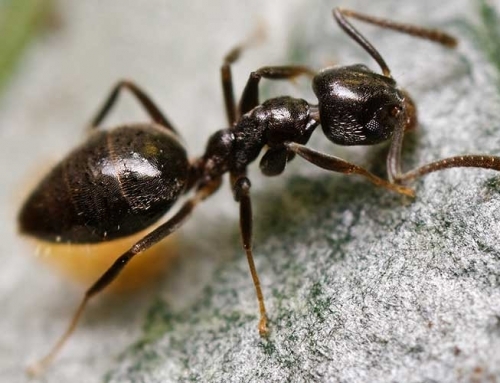 Spraying pesticides seldom works to get rid of Pharaoh ants. That’s because their nests are hidden and isolated. Spraying can often make them worse by causing an increase in egg laying and reproduction. To make matters worse, if the colony buds or divides (survival strategy that ants use) you could be dealing with several colonies each capable of causing its own special grief. In order to get rid of Pharaoh ants, a specialized baiting program works best. There are several indoor baits on the professional market that can provide “good control”, but none that will ultimately solve the problem entirely with a single application. That’s because almost all of these baits have to be “maintained” and replaced every few days. Putting out a bait one time and then forgetting about it doesn’t usually work. Maintaining the baiting program you employ will provide the best results, and give you the best chance at getting rid of them entirely. There are many excellent baits on the market for pharaoh ant control. Most gel baits for ants work by killing the worker ants. Gel and liquid baits can be eaten and consumed by workers, so their death is fairly quick. Killing the worker ants can often result in the colony not being able to sustain itself with internal food sources. Once these food sources are depleted, the queens, kings, reproductives and immature ants soon die of starvation. Worker ants of any species cannot eat solid foods. They must carry solid food back to the nest where it is fed to immature ants. The immature ants then produce a liquid that the worker ants feed on. This is why it is very difficult to kill the colony – except through starvation. The most important thing to know about baiting for ants, is that worker ants will not feed on anything unless instructed to feed by a scout ant. Scout ants find the food sources for the colony. Once a food source is located, the scout will produce what is called a “trail pheromone”. This pheromone instructs the worker ant to feed and carry food back to the colony. This is why you can place bait directly in the path of ants, and sometimes they will not feed on it. If you are lucky, there will be scout ants that find the bait and immediately begin dropping the trail pheromone. 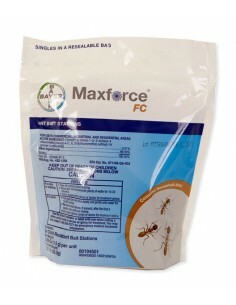 Some baits such as Maxforce Professional Ant Stations contain special attractants. The Maxforce Ant Bait Station contains silk worm cocoons as the attractant. It also contains a slow acting poison that gives the worker ants time to feed the colony. This product is by far the easiest to apply. Just place a station wherever you find Pharaoh ants and replace as needed. Maxforce Quantum Ant Bait is another good choice. Simply place a drop or two of the Quantum bait into the supplied feeding trays, and place wherever you see the ants. Drops of Quantum can also be placed inside electrical switch plates, on plumbing lines, counters, window sills and other places where these ants roam. A drop the size of a pea is all that is needed. 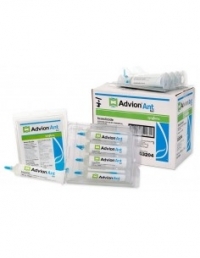 Advion Ant Bait Gel works great if the Pharaoh ants will feed on it. It doesn’t contain any special attractants, but it will kill the entire ant colony through a transfer effect. IF Pharaoh ants feed on Advion, it is probably the best overall choice as far as gel baits are concerned. This is due primarily to the active ingredient “indoxacarb”. This chemical has a transfer effect through the worker ants that will wipe out the entire colony. If baiting doesn’t seem to be doing the trick or Pharaoh ants are simply not interested in the commercial gel baits, Meteor Insect Growth Regulator may be the answer. 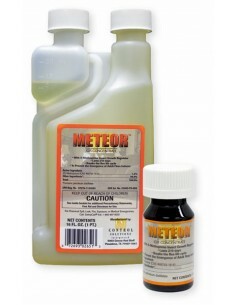 Meteor IGR contains “Methoprene” an Insect Growth Regulator or (IGR). Using growth regulators for ants will result in sterilization of the queens and ultimately elimination of the nest. Meteor IGR has to be applied in a specially made bait formula. This bait is not commercially available, you must make it yourself. Simply mix a small amount of Meteor IGR (1/4 oz) in a small bowl of 1/4 cup peanut butter and 1/4 cup apple mint jelly. Mix it all together really well and then using a spoon, fill a small syringe or turkey baster with the mixture. Then inject regular drinking straws with this mixture and cut the drinking straws into 1 inch lengths. You should be able to make about 10 straws and about 100 – 1 inch lengths that we will call “bait tubes”. Place the bait tubes in areas where the ants can find them. Inside electrical wall switch plates, plumbing accesses, cabinets, along counters, etc. Use lots of tubes depending on the size of the area you are baiting. Unused tubes can be placed in a plastic bag and stored in the refrigerator. Inspect the tubes after 1 week and see if ants are feeding on them. It is common to find small “pilings” of bait next to the tubes. This also indicates feeding. Replace any tubes that are empty and focus on these areas. Empty tubes indicate the nest may be close by. Use several tubes in areas where heavy feeding is found. Check the tubes again after 2 weeks and replace as needed. This cycle may need to be continued for 1-2 months or even longer in some cases. It may seem like a futile effort, but if the ants are feeding, control will eventually happen. You won’t see piles of dead ants, they just disappear. When there is no ant activity for at least 30 days, it can safely be assumed that they are gone. At this point it is highly recommended that a preventive exterior treatment program be started. Spraying can work, but needs to be re-performed every 3-4 weeks during the spring and summer. 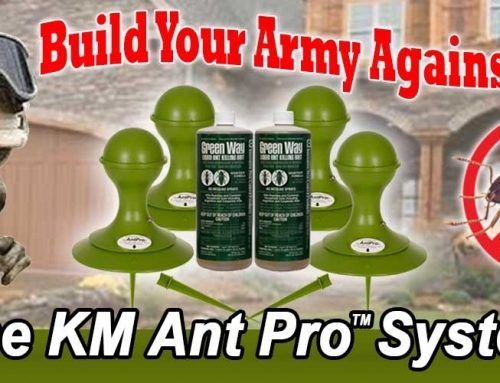 The easiest and best Pharaoh ant prevention is to use the KM Ant Pro Liquid Bait System. 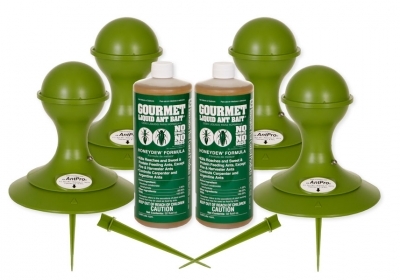 This system provides outdoor ants a continual feeding source for up to 90+ days without maintenance or refill. It also provides an exterior barrier to help “intercept” invading ants from off property areas. If You Must Spray Pesticides….. In situations where immediate control is necessary, such as in a hospital burn unit, nursery, etc, or when you just don’t want to go to the trouble of baiting, spraying might provide some relief. But beware, you can cause the ants to repopulate faster if you use the wrong chemicals or treatment methods. Spraying will kill the exposed worker ants, but it will not kill the entire colony. If you are going to spray, make certain you know exactly what you are spraying and that it’s a “non-repellent” insecticide. Non-repellent means the insects cannot detect its presence and will trail over it unknowingly. They pick it on their feet and antennae by crawling over it causing death. 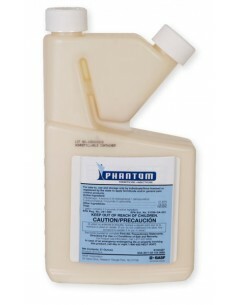 Phantom Insecticide is an odorless, non-repelling pesticide that kills ants within a few weeks of application. Phantom works by entering the ants nervous system through grooming and food sharing and then systematically kills the ants through a degeneration process. Phantom is a “metabolic inhibitor” and kills ants very slowly. It can be effective at controlling most hard to kill species of ants. It is also labeled and used for termites, cockroaches, and others. Fuse Insecticide and Termidor Foam can also be used. These products can work to kill Pharaoh ants, but are not as efficient as baits. They are also considered moderately toxic making them unsuitable for use in sensitive areas such as hospitals and nurseries. Insecticide dusts such as Timbor and BorActin can be used inside of walls, voids and cracks and crevices. These products are essentially Boric Acid based, non-repellent and very safe. Insecticide dusts will not kill the colony and will only kill the worker ants that trail through it. 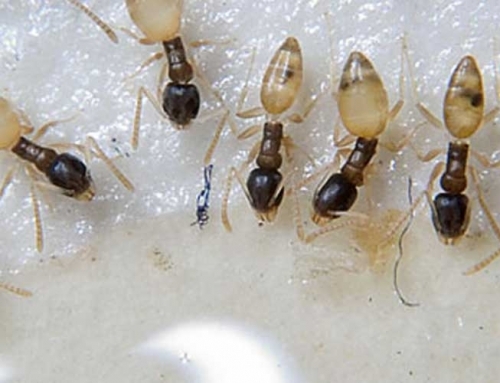 Some pest control pros will opt for spraying for Pharaoh ants over baiting. This is primarily due to lack of knowledge on Pharaoh ant biology and habits. It is also due to the pest control industry’s “spray first” and see what happens mentality. If you decide to spray pesticides before initiating a baiting program, at least understand that you may be doubling your control efforts down the road. In large commercial structures such as Hospitals, spraying is neither desired or effective. Baiting is the only real solution. Outdoor baiting with liquid baits such as KM Ant Pro Bait Dispenser with Gourmet Liquid Ant Bait is a long term solution to getting rid of Pharaoh ants. It will provide them with food sources outdoors and help prevent migration indoors. 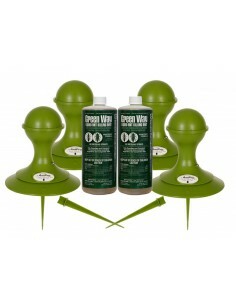 This system also helps intercept outside invading ants and creates a barrier to help prevent re-infestation outdoors. In some cases, Pharaoh ants can be controlled indoors with outdoor baiting only. This is due to Pharaoh ants continually searching for food sources. They seldom find appropriate sources indoors, so they must search outdoors too. The KM Ant Pro Liquid Bait System provides ants with a 24/7 suitable food source for up to 90 days without re-baiting or maintenance. Year round use of this system can aid greatly in getting rid of ants and preventing infestations. Kills hard to control aggressive, invasive ants such as Ghost, Odorous, Argentine, Carpenter, Pharaoh, White Footed, Crazy, Fire ants and more!